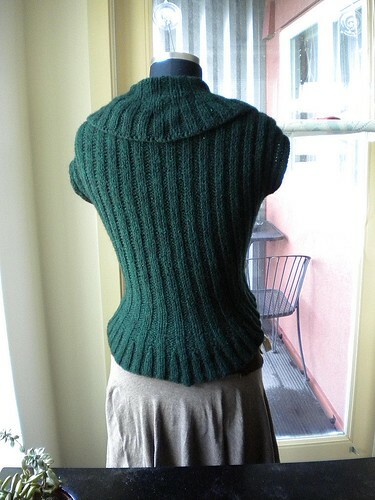 I have been playing around with the idea of circle vests for awhile- love the idea, but not usually the construction of most of them, which leaves weird arm openings or is hard to try on- or worse, some seem to require a lot of seaming, not something I want to do, especially since the seams tend to fall near the bust which is rather obvious and bad looking if not done perfectly. 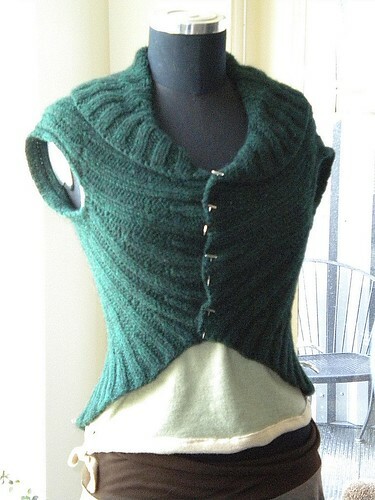 This is prototype 1 done in Cascade 220 Heathers (Color 9447) . While I usually knit Cascade 220 in 4.5 or more likely 5 stitches to the inch, I knit this at 4.5 stitches to the inch in K2 P2 ribbing (slightly stretched and after blocking), then fulled the finished vest very very (very!) slightly to bring out some fuzziness. DO NOT try doing it with something like Lamb's Pride Worsted , it would just felt too quickly. I made this with just 3 skeins of Cascade 220 , I am going to try a second version in Eco Wool . The second version with be without the increases at the edges this one has, and I won't full it. I made the math so it could be done easily in different gauges, you will hear more once I do further testing!